Home > Privacy	> Concerned About Privacy? Probably you are a Terrorist! Concerned About Privacy? Probably you are a Terrorist! 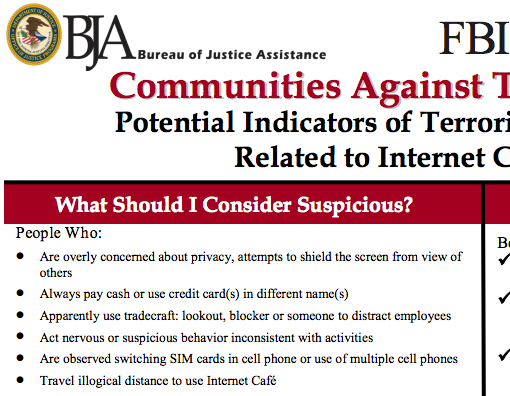 As part of a campaign by the FBI and the US Department of Justice, 25 different flyers for different industries were distributed to businesses to look out for suspicious activity that might indicate terrorism. There are flyers for Airports, shopping malls, the general public and even tattoo shops. However, the flyer for internet cafes is particularly interesting (funny, that is). It states that people who are “overly concerned about privacy, attempt to shield the screen from view of others” are suspicious, potential terrorists and should be reported to the FBI. This is not the first time FBI flyers made some people upset. In 1999 (“discovered” by the Internet in 2001) the FBI distributed a similar flyer suggesting that people who “defend the US constitution” are terrorists. While in Austria no-one would even think about doing such a thing, the constitution in the US is something quite sacred. I wonder if such flyers really help finding terrorists or criminals or if they just provide a hobby for bored neighbors to spy on each other. But I doubt there are any public studies about that. “Spying Lamp Posts” Not So Scary After All Twitter Fights for Occupy Protester: Data Belongs to User!